AS SEEN ON NBC'S "GEORGE TO THE RESCUE"
Home restoration is required for a variety of reasons. Most commonly, it is due to flood damage, wind damage, or fire damage. Homeowners are often unsure about how to proceed when tragic events strike that damage their home and don’t know who to call. ICN is here to help. As a full-service general contractor, we have all the resources to make sure your home restoration is done quickly and properly. Our skilled employees have many years experience fixing water, wind and fire damage and fixing homes. One of the biggest advantages for homeowners is that ICN will work directly with your insurance company to make sure what was lost is covered and get you on the road to recovery. Our goal is to return your home to it’s original condition before the accident, and sometimes even better! No restoration job is too big. 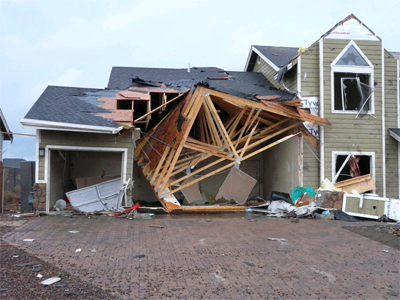 From single rooms to whole homes, ICN will help you rebuild floors, walls, ceiling, attics, rooftops, garages, even patios. We work closely with homeowners to make sure you know what to expect and when to expect. And if you have questions, we are just a phone call away. We understand it can be an emotional and stressful time when unforeseen events happen that damage your home. By hiring ICN, however, you can be confident that you have the right people on the job. Restoration is our specialty and we are always here for you. Our emergency services are available 24/7. Please contact ICN if you have any questions regarding our home restoration services in the greater Phoenix, AZ area. © 2019 ICN. All Rights Reserved.